Why stay at SENSE OF PEACE 5 STAR LUXURY VILLA? 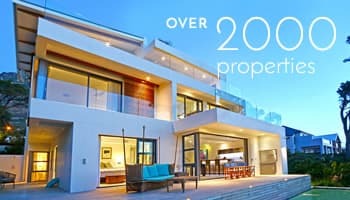 Located in the cosmopolitan seaside village of Camps Bay, Sense of Peace is an easy walk to Camps Bay’s best rated restaurants, vibrant beach bars and pristine palm-lined beach. 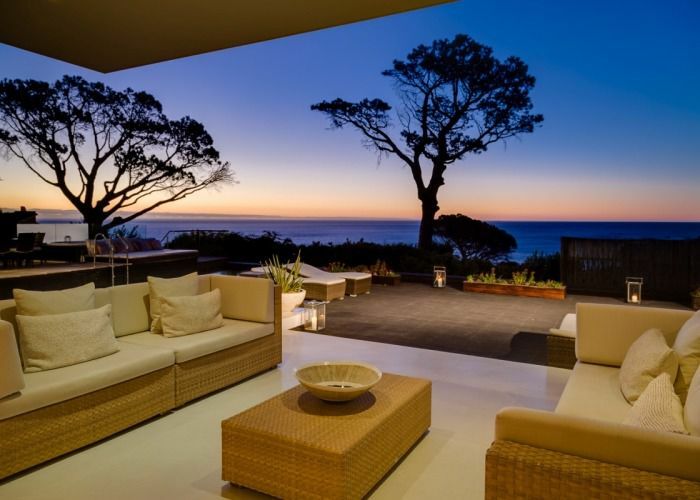 A private 5 star luxury villa for an enjoyable holiday in the wonderful location of Camps Bay. 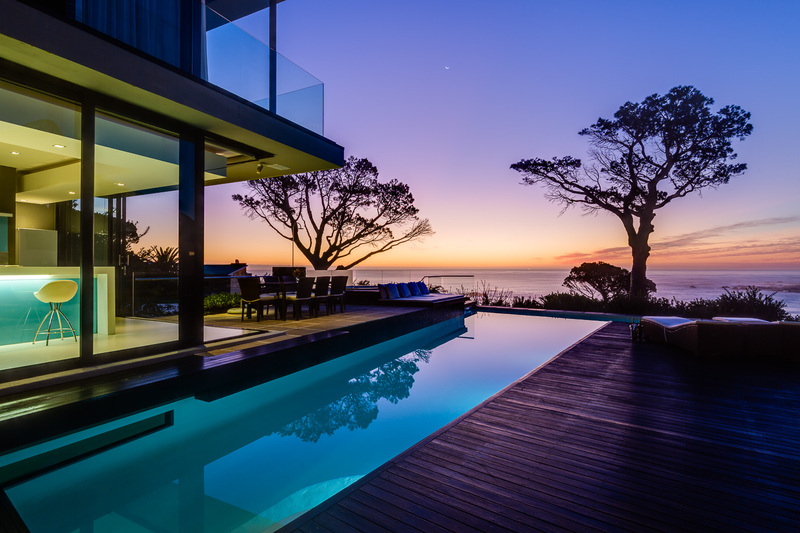 An extraordinary Camps Bay villa, widely acclaimed for its integrated design and the many ways in which it embraces its natural context. 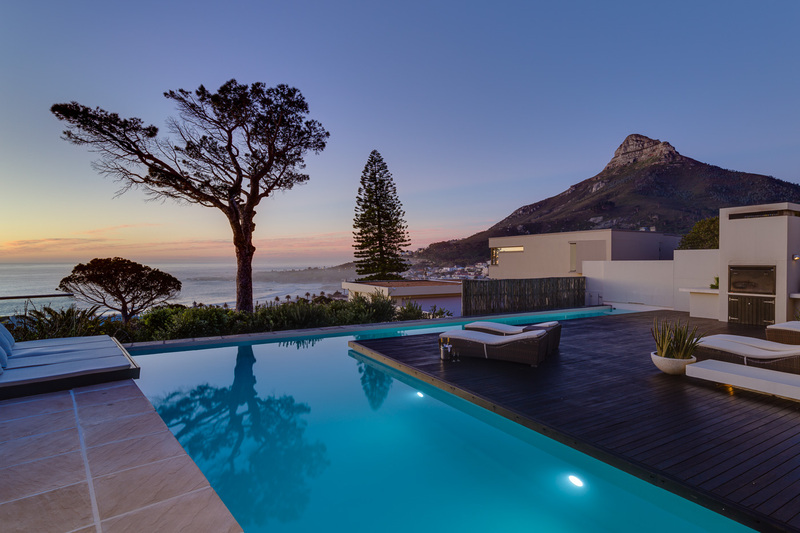 Sense of Peace is situated 8kms from the Waterfront and City Centre, 1km from Camps Bay Village and 90kms from the Cape of Good Hope. On the middle Floor (living area) you will find the sixth room. This room can only be described as a top of the range entertainment room. Ideal for those long relaxing evenings, enjoying a romantic movie. Sense Of Peace also provides for entertaining with an incredible deck area complete, with jacuzzi, 22m L-shaped pool around the perimeter of the deck and outside shower. There are also facilities to barbeque, outdoor lounge and outdoor dining area, whilst you take in the gorgeous surrounds. Inside the property offers a gym and other forms of entertainment such as a cinema room,table tennis and foozeball. Satellite television is readily accessible in most rooms as well as a DVD machine in the main living area. A high speed ADSL internet connection, and a music system with ipod option which works throughout the villa. Office area includes fax machine and printer should they be required. 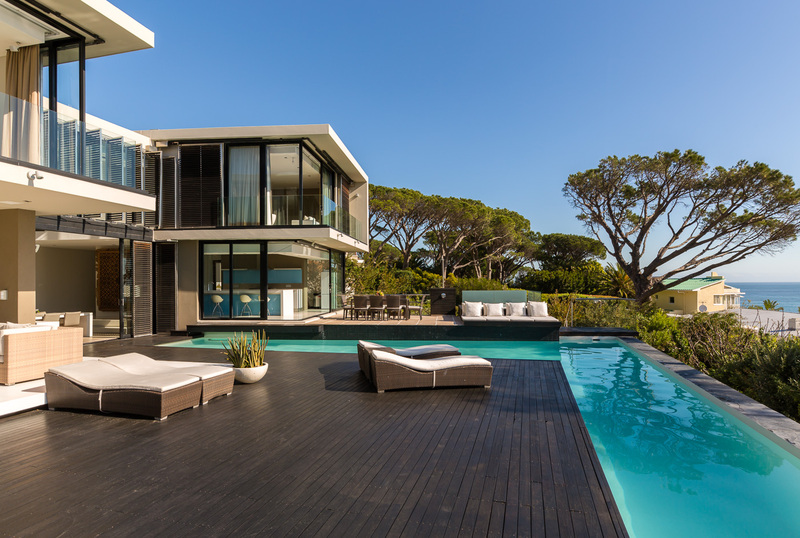 Merging urban sophistication with beach house style, make this extraordinary villa your holiday destination. Bedroom 1(main bedroom): Sea views, king-size bed, large en-suite bathroom, plasma TV with DSTV and air con. Bedroom 2: King-size bed, en-suite shower room including bidet, a flat screen TV with DSTV. This room offers Mountain Views. Bedroom 3:Sea facing, king-size bed, en-suite bathroom including bidet, plasma. Bedroom 4: 2 single beds which can be converted into a king-size with en-suite including bidet. 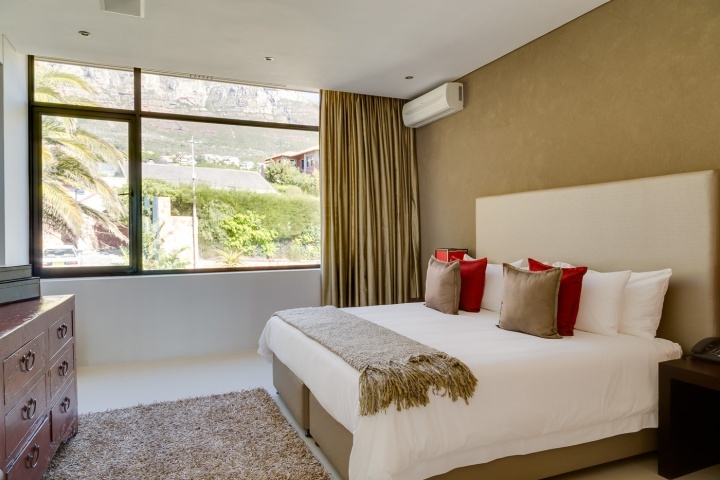 Bedroom 5: King-size bed, en-suite shower room, with a guest bathroom and small fynbos garden. Bedroom 6:Queen-size bed, double bathroom with shower. Entrance Level: This Villa has a huge amount of entertainment space. As you walk into the property past the Khoi fish, you enter into a large entrance hall. 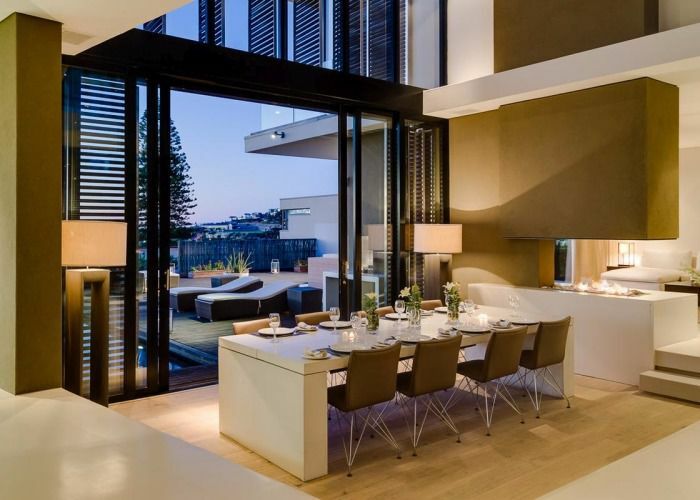 Just in front of you is a sunken dining room with floor to ceiling windows offering views out to the deck and sea. To the left of this is the kitchen which has won awards. It is simplistic in design but is one of the most sophisticated kitchens I’ve used. I was so pleased to see the kitchen was stocked with large amounts of glasses, crockery, serving ware, Nespresso machine etc, there wasn’t an appliance I couldn’t find. There is a door from the kitchen leading onto its own deck with outside dining and Jacuzzi. The Jacuzzi offers amazing views, and is definitely an inviting factor to this property. You can sit in here for hours and watch the sea while sipping on a glass of champagne. The lounge area is extremely inviting with ample couch space, large flat screen TV, DVD and DSTV. This leads onto another deck with outdoor couches, access to the pool and the BBQ. There is also a lovely gas fireplace for the winter which is seen from both the lounge and the dining room. The whole villa functions off a smart system. You can control all the lighting, music and alarm system from the iPad. Pre-set scenes are in place depending on the type of evening you are after e.g. Movie Night, Dinner There is 1 x bedroom on this level which is set back enough for it to not feel that is isn’t private. The bathroom allocated to this bedroom would also double up as the guest bathroom on this level. Downstairs level: On this level 1 x bedroom which doubles up as a cinema room giving it the edge it needs as it is the only room on this level. There is also one of the most fully equipped gyms of any Villa I’ve been too. All of the equipment is top of the range, and there is every machine imaginable available for your use. 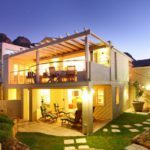 Upstairs: This level offers 2 Master suites with sea views and 2 additional bedrooms with views towards the mountain All of these bedrooms are en-suite. Bidets have been added to all of the bathrooms as well. 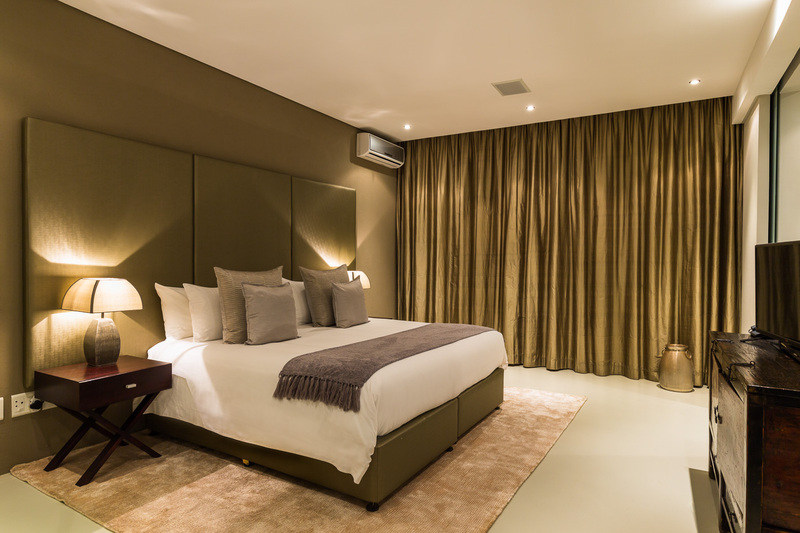 Each bedroom is extremely spacious, gowns are provided for the guests. The in house products are absolutely stunning. The two Master suits have the most exceptional views out to the ocean! There is thick lined curtaining keeping the rooms nice and dark while you sleep. 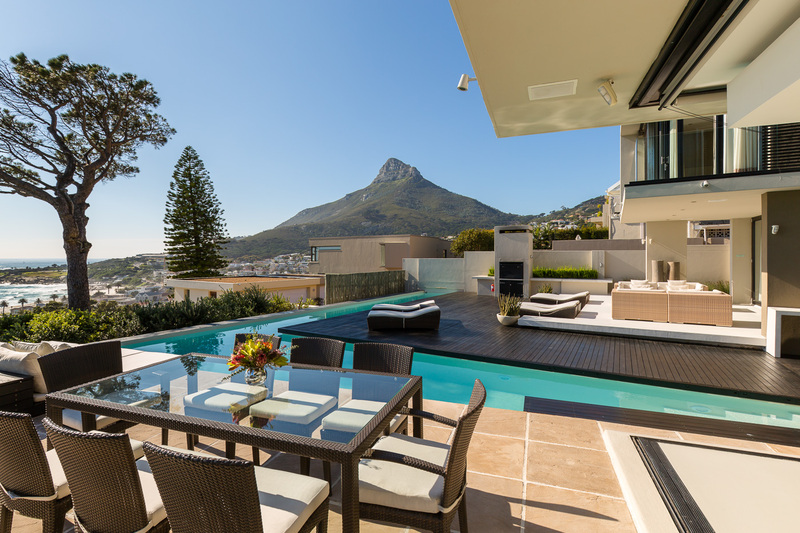 The Views 360 degree views over the Atlantic Ocean, Camps Bay Beach, Lions Head and the 12 Apostle’s Mountain range. 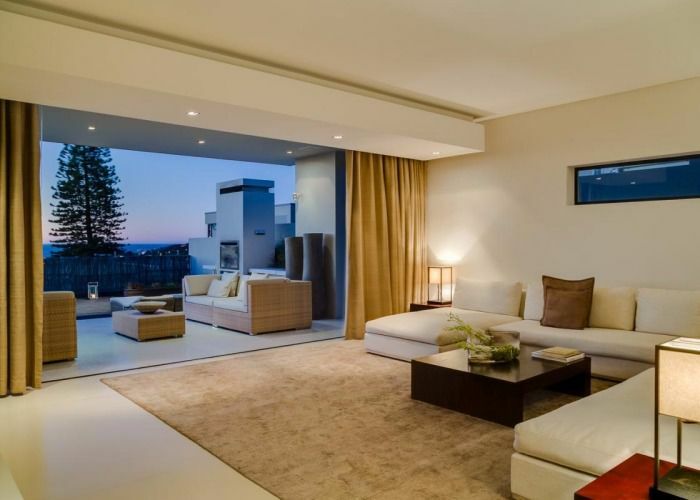 This property is a cut above the rest. It is so well maintained, it is extremely spacious and the architectural design is very unique. I would highly recommend this option as an ultra-luxury villa! Serenity...... What is there to say about this spectacular villa. As you walk through the front door you are greeted by a breath taking view if the pool and ocean. The villa boost lots of space and light and views of the ocean from the front and right behind you the views of the bold mountains. 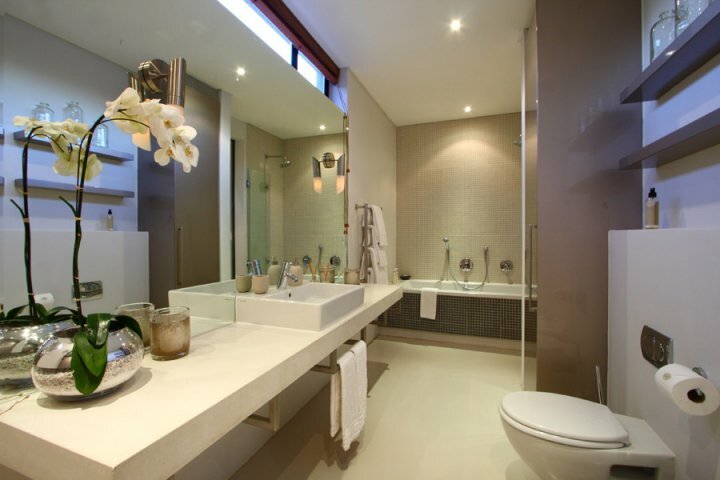 The bedrooms are spacious and the layouts of the en suite bathrooms are perfect and complement the bedrooms very well. The shower in the main bathroom is amazing and the views from the main 2 bedrooms are ones that leave you mesmerised. The kitchen is also very well laid out and has everything one could want in a kitchen. The outside area is a great place to entertain and the Jacuzzi is a definite plus to have. This villa over all is fantastic in every way from the finishes to the quality of the beds and linen. 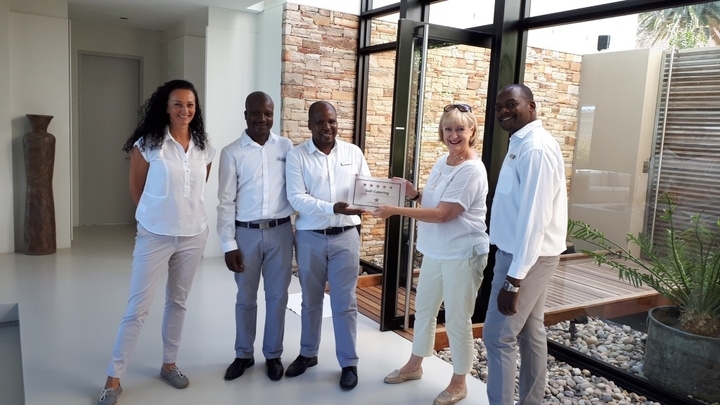 To the property manager who always makes you feel so welcome and the staff that keep the villa running like a well oiled machine. Ready to stay at SENSE OF PEACE 5 STAR LUXURY VILLA?